RoboSwift is a micro airplane fitted with movable wings, inspired by the common swift, one of nature�s most efficient flyers. It is designed and will be build by a student team. The team will participate in MAV08, a competition for demonstrating state-of-the-art unmanned Micro Aerial Vehicle (MAV) and Unmanned Ground Vehicle (UGV) technology in Agra, India. 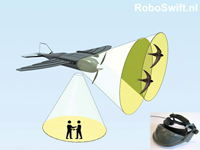 The proposed design for RoboSwift, demonstrating the morphing-wing technology. Just like the common swift, RoboSwift is able to fold its feathers backwards, thereby changing its wing area, sweep, slenderness and camber. In this way, RoboSwift's performance envelope can be enhanced, which means that RoboSwift is at the same time efficient in both low speed regions and in high speed regions. 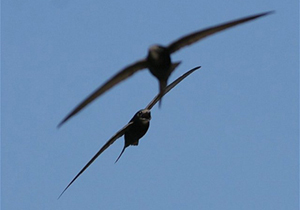 Furthermore, the appearance of RoboSwift was designed such that it resembles the common swift as much as possible. For this reason also the tail planes (which we need for flight control and stability), were designed transparent. RoboSwift will carry three mini-cameras. Two of them are used to look in front of the aircraft, one will look towards the ground. The two front looking cameras will be used for video-piloting and will be displayed on a virtual-reality headset. These two cameras can also be used for observing swifts when on a bioresearch mission. The ground-looking camera will be used for ground surveillance, which supports our ground vehicle in the competition in India. This footage will be displayed on a separate monitor. The footage of all three cameras will be sent to ground via a wireless link, so ultrasmall video transmitters are also taken onboard of RoboSwift.